Have you ever considered creating presentations to communicate with your audience? 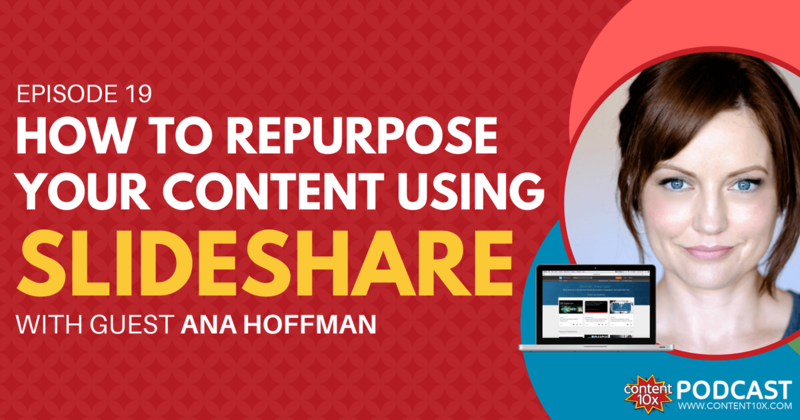 Did you know that creating SlideShare presentations can be a brilliant starting point for content repurposing? This week on the podcast I’m joined by Ana Hoffman. Ana is an expert in online marketing and the founder of the successful blog Traffic Generation Café, where she helps online business owners get free traffic to their website. I first met Ana at Social Media Marketing World in San Diego in March 2017. Ana was a speaker and she spoke about repurposing blog posts and SlideShare. Well...you can only imagine how keen I was to go and see her talk given I live and breathe content repurposing! Presentations are the key pillar of Ana’s content repurposing process. A particular focus area for Ana is SlideShare, which she’s been on since 2015. 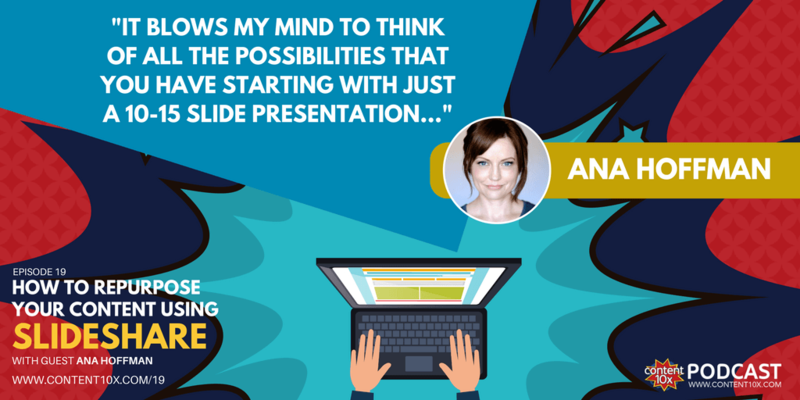 She is an expert in creating and repurposing presentations in order to drive traffic to her website. So SlideShare is exactly what I wanted to talk to Ana about! For anyone who isn’t familiar with SlideShare – it’s a platform that hosts presentations and other documents. SlideShare was founded in 2006 and it’s grown very quickly. In 2012 it was purchased by LinkedIn…then in 2017 LinkedIn was purchased by Microsoft – making SlideShare a Microsoft owned platform. Whilst presentations are the main content on SlideShare, they are not all boring, stuffy corporate presentations! SlideShare is more about using presentations to communicate a message that you may otherwise have communicated in, for example, a blog post. SlideShare is less intimidating than YouTube for those of us who don’t want to be on video or don’t have the skills, equipment etc. Even if you do have videos on YouTube, it’s very hard to get traffic to them because it’s so oversaturated. You often have to do a lot of promotion to get any traffic on YouTube. SlideShare is a great way to get traffic to your website. Ana's success has proven this and other online marketers, like Jay Baer, are also big fans. You can create a presentation very easily on PowerPoint (Microsoft) or Keynote (Mac). Funnily enough, you can also use your presentation on YouTube as well if you like. You can record your screen with screencast software (e.g. Screencast), and maybe even read out as you go through it – then you have a video! Your video need not only be for YouTube, you can then share it anywhere you like, e.g. your website. You can save each slide as an image…which you can use anywhere – on your blog post, on social media, etc. There are SO MANY content repurposing possibilities from a 10-15 slide presentation! Find images to go with each heading and each point - find royalty-free images from sites like pixabay. TIP: Find images that evoke emotion but don’t spend too much time on this!! SlideShare is not something that I hear a lot of people talking about. My conversation with Ana really helped draw out some of it's benefits and I hope it has convinced you to give it a go. Please do let me know in the comments below. To find out more about Ana click here to head over to her website.